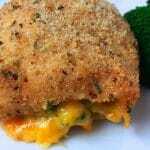 This recipe for broccoli and cheddar stuffed chicken breast is one of my favorites. It’s super easy to make and uses just a few simple ingredients. Kids love it, adults love it, and it’s perfect for a weeknight meal. This recipes uses chicken cutlets, which are basically just thinly sliced boneless, skinless chicken breasts. Most grocers carry them in the fresh meat section and they’re perfect to use. If you want to use regular boneless, skinless chicken breasts, that’s fine too! You’ll want to slice larger ones in half to have a better size to work with for this recipe. For smaller size chicken breasts, you can just pound them thin with a meat mallet. Simply place them on a hard surface such as a cutting board, cover with a piece of plastic wrap, and use the flat side of a meat mallet to pound to about 1/4″ thick. this also spreads the meat out and makes it perfect for wrapping up the broccoli and cheese. I always love to use fresh vegetables whenever I have the chance. And even packages of frozen broccoli “florets” will usually contain more stems than I like to use. So going with some fresh broccoli, steamed for about 5 minutes, is always my preferred choice. No worries though, you can definitely use frozen. Just make sure you cook it first. Usually a zap in the microwave for about 5 minutes. Here’s another thing I like to do to make these fresh stuffed chicken breasts even better – add a little butter to the inside. After I place the slices of cheese and broccoli, I add a sliver of butter. It’s just enough to add some rich flavor and creamy texture. Once we have all the ingredients in place, we’ll roll them up, dunk in egg mixture, then dredge through the breadcrumbs. Pinch the ends in as you roll them up and secure with toothpicks. This will help keep all the filling inside. Then just 25-30 minutes in the oven and you’re good to go! Prepare a paper plate with the breadcrumbs and a bowl with both eggs beaten. Set aside. Spray a baking dish with non-stick cooking spray and also set aside. Lay out chicken cutlets on a flat surface on waxed paper. season both sides with salt and pepper. Place 2 slices of cheese on each piece of chicken, layered so the cover most of the chicken. Place a couple of spoonfuls of broccoli on each and then a sliver of butter on top. Roll up each piece, folding in the sides as best you can, dunk in egg mixture then dredge through breadcrumbs. Place seam side down in baking dish and secure the ends with toothpicks. Bake at 425F for 25-30 minutes or until top is golden and chicken has internal temp of 165F with an instant read thermometer.